I don’t like going to the dentist; I’m capable of inventing all sorts of the-dog-ate-my-homework excuses for my inevitable last-minute foot-dragging. But as is so often the case, Indonesia’s reality outstrips my imagination. As I rocked up late for my regular check-up yesterday, I was able to lay the blame at the Satanically clad feet of Lady Gaga. My path to dental hygiene was blocked by Islamic groups trying to keep her out of the homeland. They included this group of young women, dressed in fashions imported wholesale from Saudi Arabia, waving posters saying: “Reject Cultural Invasion!”. No comment. The Gaga Saga has been running for a while. 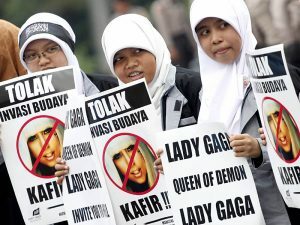 Essentially, a minority of noisy radicals in Jakarta’s largely Moslem population think that Lady Gaga is the Devil. She promotes homosexuality and general licenciousness, apparently, and as for her backing dancers, well… Student groups, the good gentlemen of the FPI (the Islamic Defenders’ Front) and even some conservative Christians have been demonstrating against the concert, planned for June 6th. The police, widely accused for years now of fainting whenever the FPI sneezes, has shilly-shallied about whether to issue a permit for the concert. They’ve said they will if the Minstry of Religious Affairs and the Indonesian Council of Ulemas issue permits first. As if Lady Gaga were a bag of chips that needed to be certified as Halal. Lots of people would like to big this up as another indication that Radical Islam is tightening its grip on Indonesia. I rather think it indicates exactly the reverse. Moderate Muslim groups as well as Gaga fans have added to Jakarta’s traffic jams with their own protests, underlining the importance of religious freedom in Indonesia. Bali has offered to host the concert. And the generally sensible Minstry of Tourism and Creative Industries has said the concert should go ahead. Yes, militant Moslems shout disproportionately loudly in the public sphere in Indonesia. They probably get their way disproportionately frequently in consequence. But how does that differ from the disproportionate influence of militant Christians in the United States? Terrorising providers of reproductive health services in Tennessee is to my mind rather more damaging than terrorising providers of sexually inclusive pop lyrics in Jakarta. Indeed the Defenders of Gaga in Indonesia have been more vocal than the defenders of a woman’s right to reproductive self-determination in many parts of the States. The thugs are stupid at a more basic level, too; no promoter could hope to scrape up the publicity that they are providing for free. Indeed they’ve gone even further; they are underwriting her tour. FPI leaders proudly report that they have bought over a hundred tickets to see the show, should it go ahead. Not, you understand, because they are interested in seeing the Diva strut her stuff, but so that they can protect other concert goers from the damage that watching her might do. As I write, the fate of the concert is undecided. but I hope it goes ahead. I’m trying to imagine what someone as creative as Gaga could do with a set of stage costumes based on the burka. On 27th of May, Gaga’s management said they would cancel the concert, because they didn’t want any harm to come to The Lady or her fans. I would not have predicted this; it makes me sick to my stomach for all the obvious reasons. 2 Comments on "Indonesia’s gone Gaga: Lessons in democracy"
I wish that Lady Gaga did not cancelled the concert in Jakarta, that way the Police have to refuse the concert, and make a big shame on themselves. Different individuals have different say in any subject. But it seems that Islamist activism are taking control of the country.